An SP101 in .327 Federal Magnum — it's like Déjà vu all over again. A SP101 in .327 Federal Magnum — it’s like déjà vu all over again. Everything old is new again. The old saying seems no more relevant than in the second .327 Federal Magnum Ruger has released in the last year. Hot on the heels of New Hampshire/Arizona manufacturer’s introduction of the Single-Six in the light magnum comes a SP101 bored for the cartridge. But this isn’t the first time the double-action revolver has been mated with the relatively new round. In fact, the small-frame beast was one of the original handguns that grazed on the cartridge when Federal Ammunition introduced it in 2007. But the revolver had a short lifespan, with Ruger pulling it from the market in 2013. The .327 Federal Magnum SP101 is back again and boasts a number of features and refinements that has hit the line in recent years. Perhaps the handiest for what should make a dandy field gun are the fully adjustable rear sights. The gun’s windage and elevation can be tailored to the shooting conditions and distance, a plus for anyone who aims to be in total control. Aiding the gun’s sighting system is a fiber optic front sight, which helps shooters focus where they should. Given the hard-hitting light magnum would make a top-notch small game choice, these features alone should get many shooters excited. The light recoil of the .327 Federal Magnum has the potential to be further mitigated by a number of aspects of the SP101. The gun’s weight, a shade under 2 pounds, is one; its grips are the other. The .327 version of the SP101 features engraved wooden grips — something that should appeal to traditionalists. But this classic feature is surrounded by rubber that runs along the backstrap and the front of the grip. The synthetic material should reduce felt recoil considerably. In addition to this, it also will aid shooters in getting a solid positive grip on the revolver every time the draw it. The new SP100 should get the most out of the .327 Federal Magnum cartridge with a 4.2-inch barrel. This gives the six-round revolver an overall length 9.12 inches, which might make it an option for some as a carry piece. The cylinder has three lock points in the frame (front, rear and bottom) creating more positive alignment and dependable operation. 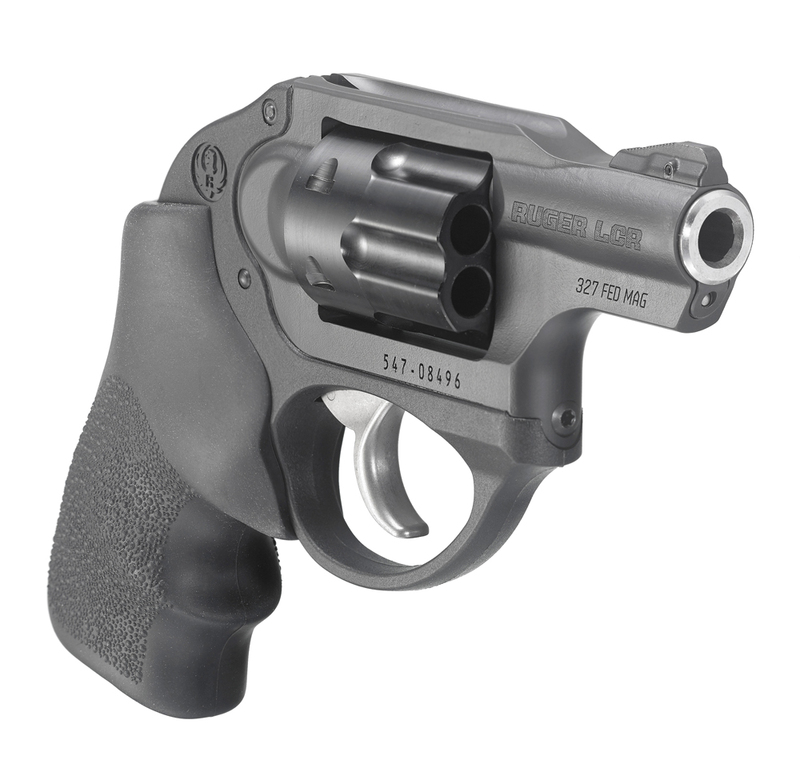 And it features Ruger’s patented transfer-bar safety, which secures against accidental discharges if the gun is dropped. Presently, the new .327 Federal Magnum SP101 has an MSRP of $719. People aren’t the same, so guns and ammo should not be the same. There are nay-sayers about loads less than .4X. I often wonder if they consider just how fast that “little rock” is traveling? Even a subsonic .22 LR traveling at 710 FPS will cover a mile in about 8 seconds. The .327 Federal Magnum is clearly a round that Ruger believes in, having brought back the 101 as well as delivering the single-seven in three barrel lengths. Folks, this is an excellent self-defense round, giving a lot of punch in the reliable revolver format. Let’s don’t argue the superiority of semi-autos or bigger bullets, the .327 Fedmag is great for varmints on four legs or two. I recently acquired the single-seven 5.5 inch barrel and it’s well balanced, accurate, and quite manageable. The SP101 is on my wish list and I’ll have one soon. Practice is affordable with the S&W .32 Long rounds, and in fact, the semi-wadcutter is a pretty formidable round even without the “magnum” moniker. My advice is always this. Get the gun you like. Learn how to use it. Bigger is better, yes. Your comfort level, your level of expertise, that’s at least as important, if not more, than the size of the whole. Kudos to Ruger for not giving up on this excellent “in-between” caliber. If a major gun manufacturer believes in it, and most major ammo manufactures make high-quality rounds for it – don’t dismiss it. Actually this is a very good caliber. Unfortunately the public at large has been brainwashed for years into thinking that caliber kills and penetration and shot placement are irrelevant. So from a marketing standpoint it was a colossal blunder. I would imagine that soon even finding ammo or brass for hand loading will be about impossible. I remember a number of years ago when Remington brought out the 5mm rim fire. Now there are rifles out their with no ammo to shoot them with. And heaven help you if you need rockets for your Gyro-Jet or ammo for your 222 Remington Magnum which was a superior cartridge to the ubiquitous .223. And how about Gocks big blunder the 45 GAP. Some say even the 40 S&W will be extinct in another 10 years. I’m late to the party, but well said. Also Beta was superior to VHS. But then, the dinosaur was superior to us. Some things are going to go away no matter what. Enjoy them while they last.